« How will the political class manage the necessary climb-down? Cold in the tropical troposphere but it should be warming if Global Warming “theories” are correct! Här kommer en mycket intressant analys över att ”the tropical troposphere” har blivit kallare. Mars 2008 vare en av de fyra kallaste månaderna på 30 år. Nå vad har nu detta för betydelse undrar ni säkert. Mycket enkelt: temperaturen i ”the tropical troposphere” är ett fingeravtryck på om teorin om att CO2 driver temperaturen stämmer eller inte. Om Global Warming ”teorierna” stämmer så skulle temperaturen kontinuerligt stiga vilket de alltså inte gör utan tvärtom sjunker. 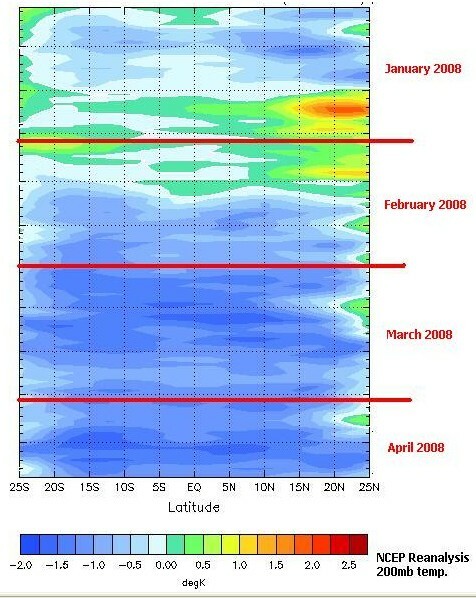 In this respect, the March 2008 satellite data for the tropics is pretty interesting. 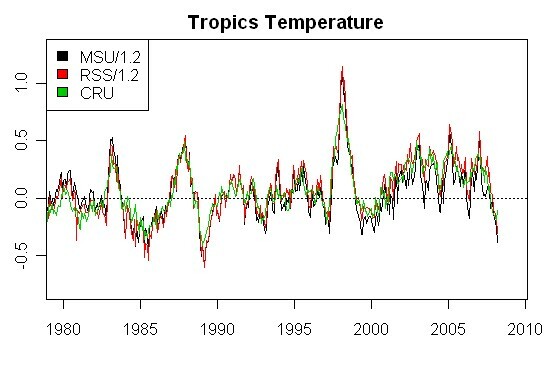 The graph below shows UAH (black) and RSS (red) for the tropics (both divided by 1.2 to synchronize to the surface variations – an adjustment factor that John Christy said to use in an email). I also collated the most recent CRU gridded data and calculated a tropical average for 20S to 20N, shown in green. All series have been centered on a common interval. Figure 1. Tropic (20S-20N) temperatures in deg C. All data shown to March 2008. Obviously each fluctuation is unique – I presume that we’ll see some sort of behavior in the next 18 months like after the 1988-1989 Nina – so that one can reasonably project that the long-term ”trend” as at the end of 2009 will be a titch lower than the trend as calculated today. While RSS and UAH move together, there is a slight drift upwards in RSS relative to UAH and there’s still a slight trend in the RSS numbers. There’s a third data set (Vinnikov – Maryland) which is not kept up to date, which has trends higher than either. Even CRU is now reporting tropical temperatures at surface that are below average during this period. I draw no conclusions from this other than some claims about the statistical significance of trends need to be examined. The autocorrelation of the data set is very high; although I’m not in a position to pronounce on the matter, the concerns expressed by Cohn and Lins about long-term persistence seem highly pertinent to the sort of patterns that one sees here. Some readers may note a graphic in summer 2005 . This entry was posted on 26 april, 2008 at 11:11 e m and is filed under Miljö - Environment. You can follow any responses to this entry through the RSS 2.0 feed. You can leave a response, or trackback from your own site.